What does the passing of years do to a Brisbane streetscape? 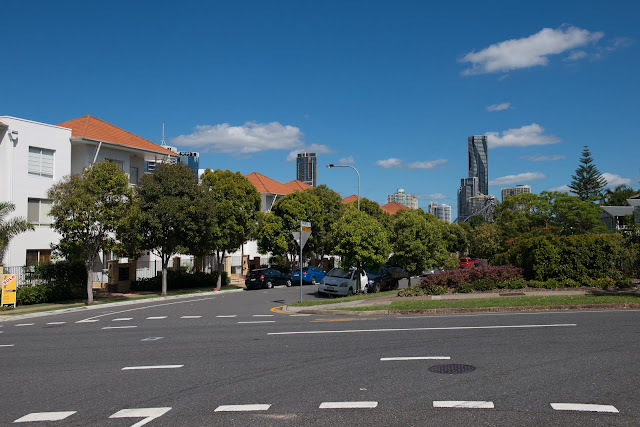 Here are before and after photographs to show fifty years of change in the near-city suburb of New Farm. Here is the corner of Maxwell St and Merthyr Rd at New Farm photographed in 1962. The houses are low set and the Story Bridge is clearly visible in the background. When we revisited the site recently, most of the houses have been replaced by apartment buildings or larger residences. That, and the mature trees, have all but hidden the bridge from view - you can just see an upper span above the red car if you look very closely. The other change is the emergence of large office and residential towers in the CBD behind the bridge. The 1962 photo of New Farm actually reminds me of suburbs of Australian cities soon after their initial subdivision. Low set houses of course and large blocks, young trees and virtually no traffic. All the scene needed was ex-servicemen and their young children playing cricket in the street. How far out of the CBD is New Farm? And when did the need for higher density living change New Farm's planning decisions? New Farm is only a couple of km from the CBD. It was actually one of the earliest suburbs where purpose built flats were erected. I'm not sure what zoning regs were changed or when that happened, but there is now a plethora of flats, units & apartments in this lovely suburb.